Are you tired of the same old car buying experience? Do yourself a favor and Dodge the City and head out to the country where we are Clearing Autos, Trucks and SUV’s to the whole province of Saskatchewan at amazingly low prices. From our Saskatchewan $10.00 Oil Change Special, to amazing deals on our whole line up of Rams,Jeeps and Dodges’ we believe in making it Worth the drive, Every-time, Guaranteed. Coming From Saskatoon, located South 20 mins and to the east of Young,SK. Keep driving through town past Centennial Ford and the Watrous Mainline GM store. You will be pleased to find that Mainline Chrysler in Watrous boasts Triple to 7 times the inventory compared to other rural Saskatchewan stores. Coming from Regina you’ll see what we mean, once you get to the top of the hill-crest,view our massive 25,000 sq ft facility and huge selection of Chrysler, Dodge, Jeep and Ram Trucks, not to mention our large used vehicle selection. Don’t forget about our King, Queen and Knight Dodge Protection packages for your new and Pre-Owned vehicle to keep them looking like the day you brought them home! Our business is built and based on Saskatchewan and we are pleased to help Western Dodge, Ram and Jeep buyers find their perfect unit no matter what their needs are. 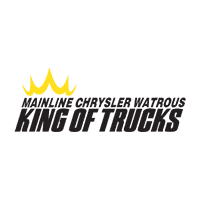 Manitou Mainline Chrysler in Watrous Call us today 1 306 WATROUS and let yourself Experience the Difference!